Disease - inflammation of the mucous membranes of the oral cavity and dystrophic changes. The disease can be caused by damage (mechanical, chemical, physical), diseases of metabolism (avitaminosis, diabetes, diseases of the cardiovascular, the nervous and hematopoietic systems, acute and chronic infection, drug intoxication, diseases of the gastrointestinal tract. Form of manifestation distinguish stomatitis catarrhal and necrotic lesions, etiology - traumatic and stomatitis caused by diseases of the body. Factors causing traumatic disease - dental calculus, incorrectly made dentures, fillings, burns hot food, the effects of alkalis, acids, etc., In short-time impact of harmful factors develops catarrhal process: the mucous membrane becomes damaged, swollen, appears bleeding; with prolonged action - ulcers around which develop inflammation. Stomatitis caused by diseases of the body, characterized by the appearance on the mucous membrane of the mouth of the aft (see) or ulcers. These stomatitis can occur acutely and chronically. Acute aphthous stomatitis occurs more often in children suffering from gastrointestinal diseases and datetime. The disease accompanied by increased body temperature. On the mucous membrane of the gums, lips, palate appear afty, surrounded by bright red bezel, excessive salivation. Submandibular lymph nodes are enlarged and tender. The disease lasts 7-10 days and ends with the recovery. Sometimes aphthous stomatitis occurs when a disease or injury of the Central nervous system (neurosises, a concussion, strokes). Chronic recurrent aphthous stomatitis characterized by periodic appearance on the lining of the cheeks, the side surface of the tongue, lower lip single aft, the bottom of them is covered with gray-yellow tinge. Lymph nodes generally are not enlarged. The disease lasts 5 to 10 days, after which afty epiteliziruyutsya or turn into ulcers. Ulcer disease often occurs when acute enterocolitis, ulcer disease of the stomach, after sore throat, influenza, treatment or intoxication by drugs mercury, bismuth. Ulcers can be located throughout the mucosa, there is unpleasant smell from the mouth, excessive salivation. 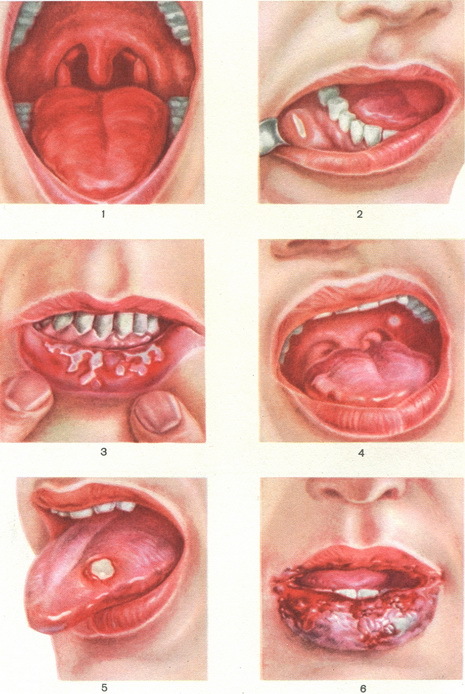 In diseases of the blood (leukemia) in the mucosa of the mouth and tonsils appear afty, then turning in ulcers. Stomatitis is often accompanied by infectious diseases. When measles mucous lining of the cheeks, the lips appear irregular in shape bright red spots. With the fall of the temperature and the appearance of a skin rash, they usually disappear. When scarlet fever for days before the rash appears on the skin, the mucous membrane of the oral cavity often becomes damaged and dry. The tongue is covered with a yellowish-white film, then gradually cleared and gets a distinctive crimson red, papillae bright act ("raspberry" language). Diphtheria mouth on the edge of gum, on the tonsils appear grayish-white, dense raids. When flu on the mucous membrane of the mouth sometimes see rash in the form of small bubbles; they contain a clear liquid, but after 2 to 3 days the liquid becomes cloudy, bubbles burst and form in their place ulcers. The disease may be caused by parasitic fungi; one of these diseases, the so - called thrush (see Candidiasis), which is more common in the weakened children, adults of the same disease may occur during prolonged use of antibiotics and decreasing the body's resistance. Fig. 1. Catarrhal disease. Fig. 2. Chronic recurrent aphthous stomatitis. Fig. 3. Drug-induced stomatitis. Fig. 4. AFTA on the palatal arch. Fig. 5. Ulcers on the tongue. Fig. 6. Herpetic stomatitis. Treatment. First of all eliminate the factors irritating mucous membrane,is a dental stone, the sharp edges of the teeth, incorrectly made prostheses. The mouth treat 3% solution of hydrogen peroxide, 0.25% solution of bleach. To reduce the pain using 10% mix with glycerin benzocaine. Not recommended ulcer and erosion process cauterizing substances. Inside appoint a multivitamin, 10% solution of calcium chloride, diphenhydramine; if the disease caused by the fungus disease or antibiotics, appoint nystatin. Recommend mashed food, light diet, frequent rinse 2-5% solution of sodium bicarbonate (baking soda). As a rule, stomatitis quickly cured. In protracted illness of the patient should be thoroughly examined. Prevention of the disease is reduced to the periodic readjustment of the oral cavity (see), the elimination of occupational hazards, treatment of common diseases of the body.